MEXICO CITY, Jun 7 2012 (IPS) - Small farmers in Mexico, who receive little institutional support, are drawing on their traditional knowledge to deal with and adapt to climate change, experts say. “Campesinos (peasants) have a strong tradition of expanding their territory, which makes them quite flexible” in dealing with new conditions, Fernando Briones, a researcher at the public Centre for Research and Higher Studies in Social Anthropology (CIESAS), told IPS. “But their traditional knowledge doesn’t always work. Adaptation is not a lineal process,” he said. 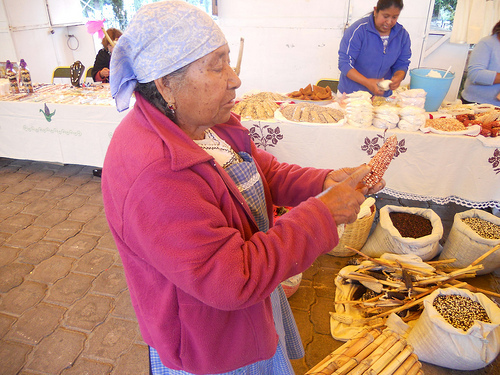 The academic carried out the study “Saberes y prácticas climáticas de los pueblos indígenas de México: los choles” (Climate wisdom and practices of the Chole indigenous people of Mexico), focusing on an indigenous community in the city of Tila in the southern state of Chiapas, one of the country’s poorest states. He studied the farming practices and expertise of the Chole people, one of 62 native groups who make up between 12 and 30 percent of the country’s 112 million people (the smaller, official, estimate is based on the number of people who speak an indigenous language). Describing some of the traditional practices, Briones said Mexico’s campesinos stagger the planting of their maize, beans, coffee and other crops. Some is done before the rainy season starts in June, a much larger part is based on the traditional calendar, and the remainder is done once the dry season has started. Another practice is to plant at different altitudes. The region studied by Briones, where agricultural producers are mainly engaged in subsistence farming, frequently receives rainfall so heavy that it causes flooding and mudslides. There are approximately five million campesino families in Mexico, according to the National Institute of Statistics and Geography (INEGI). Chiapas, which is exposed to torrential rains, drought, forest fires and deforestation, is one of the parts of Mexico most vulnerable to climate change. “Communities have created local governance systems…They are the ones who decide on actions in response to climate change,” Pedro Álvarez, the head of biological resources and corridors in the Mexican National Commission for the Knowledge and Use of Biodiversity (CONABIO), told IPS. One of the projects carried out by CONABIO since 2008 in the 1.8-million-hectare Lacandon jungle, one of the most biodiverse areas in the country, has managed to reduce the deforestation rate from five to 0.5 percent, with the active participation of the local inhabitants. The communities manage and care for the rainforest, for which they receive an annual payment for environmental services. Mexico emits an estimated 709 million tons a year of carbon dioxide (CO2), one of the main greenhouse gases responsible for global warming. Of that total, Chiapas is responsible for some 32 million tons, mainly from soil use, deforestation and agriculture. Chiapas is home to 4.8 million people, one million of whom are indigenous, according to INEGI. Farmers closely observe climate-related signs, such as the appearance of certain plants and insects, and the migration of birds, indicating the advance of the rainy season. Briones’ study on the Chole (which means “people of the corn” in the Mayan tongue) Indians was carried out under the Risk and Vulnerability Network: Social Strategies for Adaptation and Prevention, made up of universities from Britain, Finland, France, Italy, Mexico and the Netherlands. In many communities, farmers use agroecological practices such as organic fertilisers, recycled water, and crop diversification to avoid exhausting the soil. A 2009 study, “El impacto del cambio climático en las tierras y sus características” (The impact of climate change on soils and its characteristics”, by the ministry of the environment and natural resources warns that 80 percent of the 30 million hectares of farmland in the country are highly vulnerable to climate change, which threatens national food security and the poorest segment of the population. Poor campesinos will suffer the greatest difficulties in adaptation because they cannot afford crop insurance or new technologies that would give them access to information about planning crops and harvests. Traditional knowledge will therefore fall short, because means of curbing erosion, boosting family income and maintaining soil organic matter are also needed. CONABIO has spent more than three million dollars on the project in the Lacandon jungle. Briones said the issue went beyond the survival of an indigenous community, and had to do with the country’s food security. “There is quite a lot of potential for adaptation, but to have a greater impact, essential questions must be resolved, such as the basic problems of the Mexican countryside” such as poverty, lack of financing, productivity problems, and a lag in technology, he said.